SASKATOON — Canada's negotiating team spent several hours Wednesday updating Prime Minister Justin Trudeau on the state of NAFTA talks and getting his marching orders for the days ahead. Foreign Affair Minister Chrystia Freeland refused to go into any detail about the issues on which the prime minister needed to sign off or what instructions she and the rest of the NAFTAteam received. 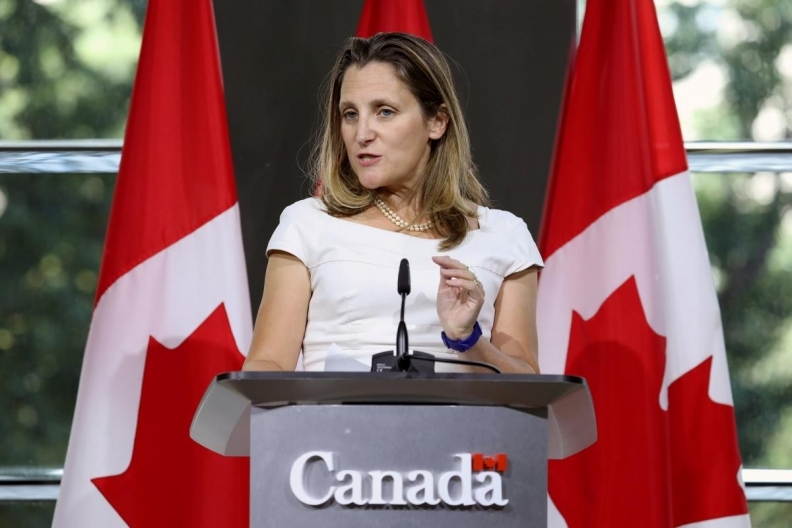 However, she said lead negotiator Steve Verheul and David MacNaughton, Canada's ambassador to the United States, would be returning to Washington immediately to resume negotiations on Thursday. Freeland herself will not be returning to Washington right away, but said she'll be keeping in close contact with her American counterpart, trade czar Robert Lighthizer. She said the fact that she and Lighthizer are not immediately scheduled to meet again should "absolutely not" be taken as a sign that the talks are stalled. "This is absolutely a process which is moving forward. It is a continuous negotiation," Freeland said after her second briefing of the day with Trudeau. "In negotiations, you do work and resolve the issues that you can at the ministerial level and then you reach points where what is needed is continued technical work." "Getting there is going to take goodwill, good faith and flexibility on all sides," she added. "This is an important time in the negotiation and so it was really important for me, for the negotiators to speak directly with the prime minister to brief him on the issues and to have him give us his instructions on where to move going forward," Freeland said. Earlier, in a brief speech opening the caucus retreat, Trudeau went out of his way to praise the "formidable, tireless" Freeland and her determination to get a deal that is good for Canada. He reiterated his assertion that no deal is better than a bad deal. However, Saskatchewan Premier Scott Moe later said he's not sure that's true. "We cannot move forward with a bad deal. I'm not certain we can move forward with no deal either," he said after meeting with Trudeau. "We need to engage with the United States. They are our largest trading partner." Quebec Premier Philippe Couillard, who is the midst of an election, said Wednesday he wouldn't accept an agreement that doesn't meet the approval of dairy farmers in his province. While Trudeau has vowed to protect Canada's system of supply management which regulates the price of dairy, eggs and poultry, he has also indicated he's willing to be flexible on allowing some limited additional imports, as was done in the Trans Pacific and European Union trade deals. However, dairy farmers maintain they've already made enough concessions and shouldn't have to do so again to get a NAFTA deal.